I would also suggest you pick up the book "Where did the tracks go in the central Adirondacks?" by Kudish. The book contains maps of the entire NYC Adirondack division along with sidings and descriptions of online industries that existed along the way. There is a companion book of the same title except for the western Adirondacks which would probably have more info about the Lowville/ Carthage area, but I have not read that book myself. You might also want to check out a book titled "Rails in the North Woods, which includes an extensive chapter (with some pictures) of the L&BR. Someone built an HO model of the L&BR. It may be in the Croghan depot now. The U&BR ran all the way from Utica to Clayton. 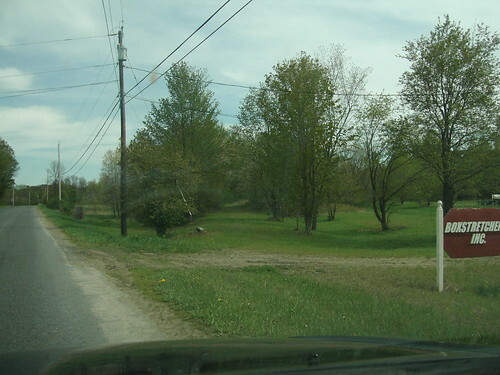 Existing mileposts on the section from Lowville to Philadelphia still have a "U" prefix and still measure the distance from Utica. A judicious eye can still pick out much of the ROW between Lyons Falls and Lowville in satellite/aerial photos. tree68 wrote: A judicious eye can still pick out much of the ROW between Lyons Falls and Lowville in satellite/aerial photos. I just want to correct the spelling of the seasonal tourist RR, its spelled Adirondack scenic railroad. This line runs trains from late spring to november. They also have a phone # and I think a web site. hrfcarl wrote: BTW, does anyone own this ROW? Since it's been 45 years since NYC pulled up the spikes, I'd imagine most, if not all, has gone to adjacent property owners. As has been mentioned, a lot of the old ROW now runs through fields. Right now the existing Carthage-Lowville segment is making money for MA&N by holding stored cars. Reference: Industry between Remsen and Lake Placid on the Scenic. There is one gravel pit/quarry not far out of Remsen which MA&N occasionally visits. It's right on the main, so you'll never see cars just sitting there. If logging were still a major industry in the Adirondacks, I'm sure some business along that line could be drummed up, but it's not. There never was a whole lot more until you got to Tupper Lake, and even that didn't amount to much. When built (and until the line between Lake Clear Junction and Malone was lifted) it had more value as a bridge route for freight than anything else. I'm sure the businesses that were served would disagree, but I think that's basically true. Webb's basic premise was to open up the Adirondacks for recreation - and certainly the settlement and growth that would follow. The creation of the Adirondack Park tripped him up. It's pointless to even think about restoring that line. There's little traffic on either line - and certainly nothing that would require "through" service from Lyons Falls to say Carthage. CSX serves both MHWA divisions and would act as a bridge carrier if there was ever a need to transport a car from one division to the other - and at a price that would be a teenie tiny fraction of spending at least $14,000,000 to restore the line... that is if they could buy back the ROW from the people who have owned it for a good 40 yrs now. There was a rumor floating about at one point early on in the MHWA era that it would be restored to provide an emergency second route for Fort Drum traffic, something about a law requiring one, but it stayed a rumor. New York Central abandoned portions of duplicate through routes when they were no longer needed as through routes simply to cut back on the expenses of maintenance and property taxes. It may have been of added benefit to them to have more customers turn away due to poorer service levels and allow them to abandon more trackage. Another example of this is the West Shore west of Albany, which had various segments abandoned through the years prior to Conrail. After a while it would get to where unless there were large customers on line it wouldn't be profitiable to operate them any longer. I think most of us know the rest of the story. You also have to remember that from the 1960’s on branch and secondary lines became less important to big railroads whose profit was in long hauls long trains not short branch line locals. The PC merger and Conrail didn’t help either. After Conrail’s start on Apr 1 1976 various short lines formed to take over unprofitable branch lines that CR didn’t want. Some might have started before Conrail. Southwest of Reading, PA is a similar situation, a former Reading branch line to Lancaster was split in two at some point, either Reading Co. or Conrail ripped up the section through Ephrata between Denver and Lititz I believe. East Penn owns the northern section from Sinking Spring (NS trackage rights to Reading) to Denver, and NS from Lititz to Lancaster. Probably what happened is that it was no longer viable or profitable as a through route so the middle section was lifted where there were probably zero freight customers. Oops, didn’t notice that the last post was in 2009. How many miles of track was abandoned in the 1960's? Also, what was the name of this branch between Utica and Northern Points. I know it was part of the St. Lawrence Division. Just a note, if you are curious on the beginnings of this railroad, The Sapbush Run is the history book about the Utica and Black River Railroad. And one more. Is the Northern end of the line still being refurbished? I know it was back in 2016.
rwk wrote: You also have to remember that from the 1960’s on branch and secondary lines became less important to big railroads whose profit was in long hauls long trains not short branch line locals. The PC merger and Conrail didn’t help either. After Conrail’s start on Apr 1 1976 various short lines formed to take over unprofitable branch lines that CR didn’t want. Some might have started before Conrail. Southwest of Reading, PA is a similar situation, a former Reading branch line to Lancaster was split in two at some point, either Reading Co. or Conrail ripped up the section through Ephrata between Denver and Lititz I believe. East Penn owns the northern section from Sinking Spring (NS trackage rights to Reading) to Denver, and NS from Lititz to Lancaster. Probably what happened is that it was no longer viable or profitable as a through route so the middle section was lifted where there were probably zero freight customers. Oops, didn’t notice that the last post was in 2009. By the 1960's - you had a pretty good interstate highway system in place and a growing trucking industry. Most of your short-haul started going to the 18-wheelers - especially when "just in time" inventory started becoming a thing with manufacturers. That and the union agreements at the time called for 5-man crews which made the branch lines unprofitable.